Looking for Apollo A8 Parts? FAST IMPECCABLE PRINT QUALITY ON WIDE LABELS! the A8 is a fast new label printer specifically designed for wide web label printing up to 9" (230mm), ideal for applications like chemical drum labels and pallet labels! And like printers in the APOLLO SERIES, the A8 also offers versatile options, including the unique stand-alone feature that allows label printing with or without a computer attached! The new A8 is loaded with standard features! The rugged thermal/thermal transfer label printer features 203 dpi print resolution running at 5"(125mm) per second with an 8.5" (216mm) print width. The A8 comes standard with an internal rewind, as well as a high-speed 32-bit processor with 4 MB of RAM, so the A8 is fast, with more standard RAM than most other label printers, ideal for downloading TrueType fonts or graphics, creating dramatic labels with impeccable print quality on bar codes, graphics and text. While most label printers offer 1 resident scalable font or none at all, the A8 features 3 printer-resident scalable typefaces. I-Mark sensing, and a back-lit LCD display for higher readability in dimly lit areas, are also standard. IT WORKS WITH OR WITHOUT A COMPUTER! 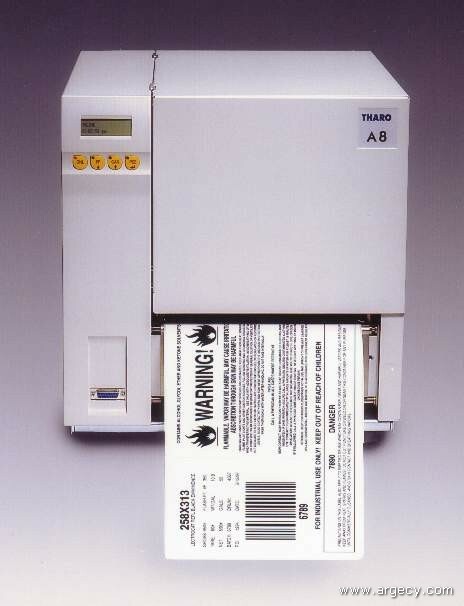 The A8, like printers in the APOLLO SERIES, also features the ability to work with or without a computer attached, giving you much more flexibility in meeting your labeling requirements. This stand-alone feature is ideal for saving workspace, environments harsh to computers and eliminates computer operator training. A8 is also great for printing labels in remote locations, thus eliminating the need for additional computers. A8 works great with a computer as well! In fact for system integration, it may be one of the easiest-to-interface printers available. Serial up to 115,200 baud, Centronics parallel, and RS-485 networking interfaces are all built into the A8. These interfaces, along with the fact the A8 programming language requires no control characters, allows interfacing with virtually any system including minis, mainframes and UNIX systems. The A8 gives you workhorse-like production too! Recent APOLLO units back for reconditioning exceeded 33 million inches of output! Ball-bearing drive trains and high-duty cycle performance give you impeccable print quality on standard paper labels, as well as synthetic materials. A8 supports all the popular bar codes, including UPC/EAN, Code 39, Code 128 and Interleaved 2 of 5, as well as two-dimensional symbologies like PDF417, Datamatrix with ECC200, and UPS-MaxiCode. Print Width: 8.5" (216mm) max. Print Height: .2" (5mm) min; 47" (1200mm) max. Media Width: 2" (51mm) min; 9" (230mm) max. Bar codes variable in height, module width, and ratio. As required with test code, printed characters and start/stop code. To rewind the label liner following printing in Present Mode. For rewinding a partial roll of labels, a Rewind Guide Plate is provided with the printer. OEM-848-003 Serial Cable 9 Pin, 10 ft.
OEM-848-004 Serial Cable 25 Pin, 10 ft.